The story behind the photo. In 2008 I spent a week at beach lodgings on Playa de Huina on the Pacific coast of Colombia near Bahía Solano. The morning of my departure I took the outboard then land transport to the small airport to catch my flight back to Cali via Medellin. There were inexplicable delays and a couple of hours later I saw the big military helicopter out on the single runway. It turned out that a group of six tourists that included a Norwegian had been in an ocean going outboard that morning that made an un approved landing on a beach near Nuquí further down the coast and were kidnapped by the FARC guerrilla (Fuerzas Armadas Revolutionaries de Colombia). The airport in Bahia Solano would be closed to commercial air traffic while military helicopters loaded supplies and troops to go look for the kidnap victims in the Chocoan jungle. Luckily for me the runway was eventually cleared and the incoming flight from Medellin landed and took on passengers. The search that day was unsuccessful and the tourists were held in captivity for a month before being released unharmed. 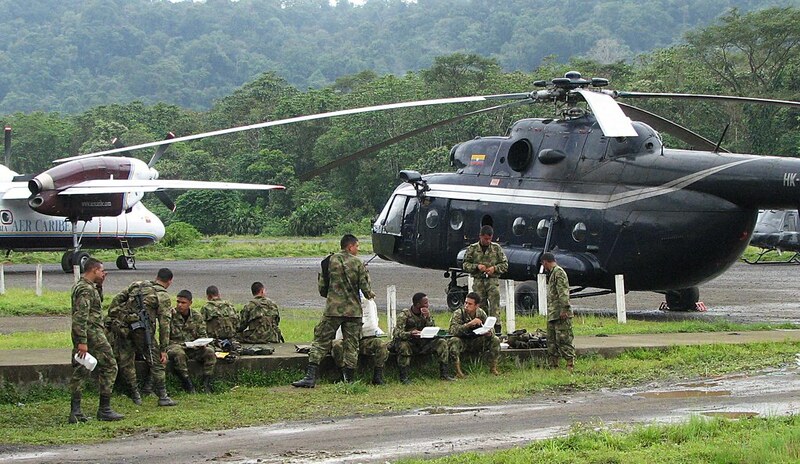 Here are Colombian soldiers having lunch on the runway before boarding a helicopter to begin the search. The picture is e cellent and revealing. No one is signaling to you to stop photographing. These are a very professional team of young men and I think they are elegant with their helicopters! In a repressive regime, you would have been arrested for taking this picture! I hope you took a few more. This really is the coolest shot ! Extraordinary circumstances of humans. Thank you Charlotte and Asher. Heart warming story with a wonderful image as illustration. Why they kidnapped innocent people? This story made me sad. Thank you fahim. Roshni the guerrilla groups in Colombia kidnap innocent people for two reasons, so their family will pay for their release and to put pressure on the government. Fortunately this isn't being done by the guerrilla groups much any more but it is still done by common criminals for money.